A company called Legrand offers a collection of products called Adorne. And, let me just tell you, they are fantastic! Finally, there is a pretty solution to the switches, outlets, lighting and electronic charging problems we find in the kitchen. 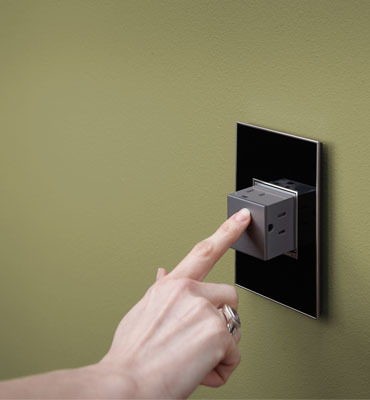 Take, for example, this pop-out electrical outlet. I think this is a great way to maximize the number of outlets in your kitchen backsplash while minimizing their look. And, it fits in most standard electrical boxes, making them ideal for a remodeling project (ie, you don’t have to tear out your entire wall to install them!). They have also redesigned the standard electrical outlet and wall switch to make it sleeker. The new design is modular, and any of the switches or outlet configurations work with their standard outlet cover plates. You can mix and match switches, outlets, USB charging ports, nightlights and more. The cover plates come in many standard plastic colors, allowing you to customize them for your home. But, my favorite part is the metal, wood and custom plate options like the one below. 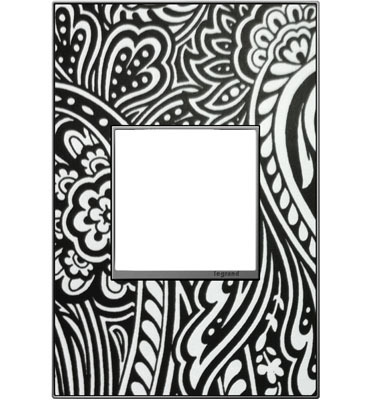 With this plate, you can place any wallpaper, pain color or fabric behind the front cover for a completely custom look. There is even a custom tile option! What a great way to blend the plates in with your decor. 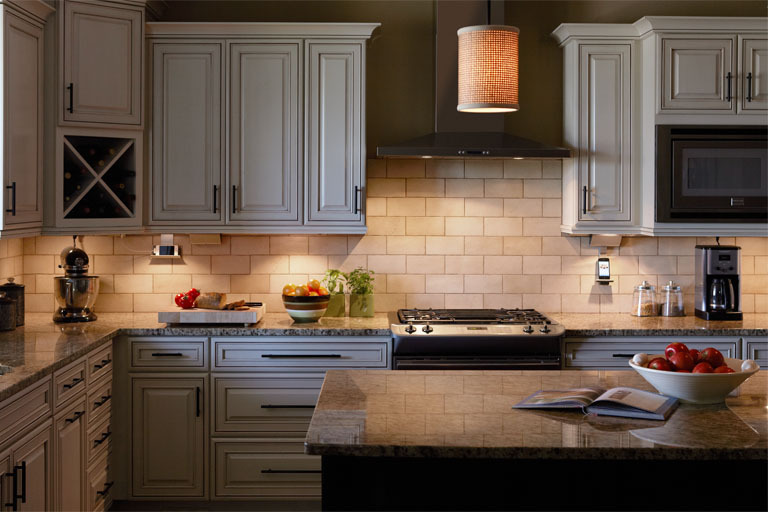 The creme-de-la-creme, however, is this undercabinet lighting and outlet solution. The modular track pieces fit under the upper cabinets in your kitchen, and allow you to add or remove electrical outlets and switches where you need to. You can also add lighting where you need it, and place speakers for your bluetooth system or i-pod right in your kitchen. 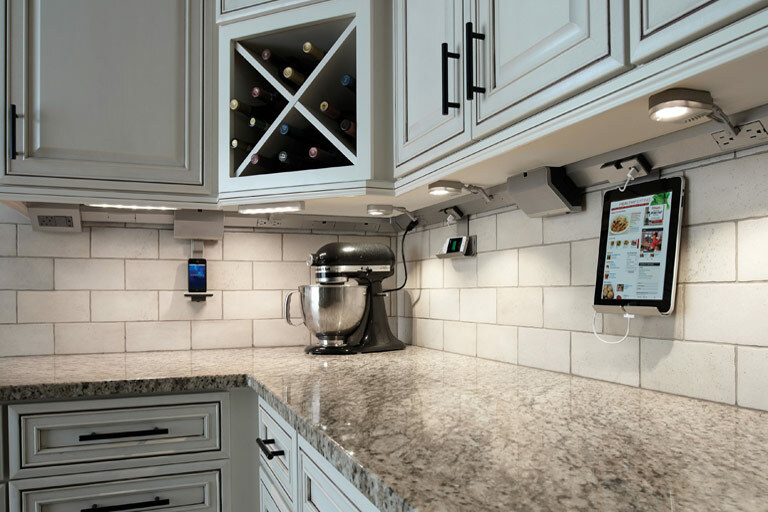 The phone and tablet cradles provide not only a place to charge your devices, but also a way to look up that recipe while you are cooking – and keep your electronics easy to see and out of harm’s way. How great is that? And, the speakers and cradles are easy to remove, so you can get them out of the way when you entertain or when they aren’t in use. I also love the fact that this entire system is attached to the cabinetry above, so you never have to drill into your custom tile backsplash to install it. You may think this is a paid advertisement for the Adorne collection, but I don’t write paid articles. And, alas, I do not have one of these systems in my home. But, I have had the opportunity to try it out in the showroom, and I think it’s too great a product NOT to pass on to you. So, if you are looking for inconspicuous and super-functional electrical solutions in your kitchen, check it out. You won’t be sorry! ← What is Upcycled Home Decor?